Starfall Education Foundation PO BOX 359 Boulder, CO 80306 Toll-free: 888-857-8990 Local: 303-417-6434 http://www.starfall.com/ By Joseph Grayhaim Starfall.com is an elementary-grade web-based curriculum that is free of charge as a public service. Starfall’s phonics-based approach has been teaching children to read for more than ten years. They have an entertaining audiovisual portion of the program that successfully serves children from preschool to 2nd grade – homeschooled or not. Starfall’s program is also the solution for the problems of reading experienced by children who have English as their Second Language. Much of the Starfall program is free, but they also offer an extended content for a low-cost membership, which adds songs, math and other reading activities up to the 2nd-grade level. The Starfall website is a wonderful, positive alternative to T.V. or video programs that are simply meant to entertain. Starfall’s presentation of the alphabet is visual and audio, with each letter presented by itself, its pronunciation spoken by the program and then various pictures of objects that start with that letter are shown and when you click on the initial letter, the name of the object is spoken. For instance, “A” and “a” are pronounced, then an apple is shown; clicking on the initial “a” in apple, produces the pronunciation of the word apple. In this way, a very young child can practice seeing and hearing the letters of the alphabet alone and in action with other letters and sounds. I can imagine a little person being entirely engrossed in the Starfall program for many fruitful hours, developing literacy and having fun at the same time! 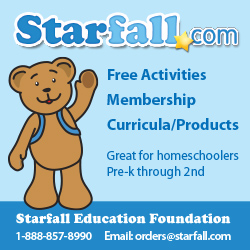 Starfall includes many other activity sections that expand the child’s knowledge and fluency. There is a section for making simple words, using beginning letter sounds and ending letter sounds (p-an, f-an, etc.) and other similar reading exercises, all designed with fun activity in mind. The mathematics section and some advanced reading sections require a membership, but it is low-cost and the free reading sections are more than adequate to help your child to the foundations of literacy and beyond! Please visit the Starfall website for complete information and see how the Starfall curriculum fits into your child’s learning world. J.G.